I never "left" it, so I didn't have to go back to butter, but I know a lot of people do when they start caring about what they put into their bodies, and once they find out what the new medical studies show about the relationship between what they eat and the cholesterol in their arteries -- or rather, the lack of such a relationship. Now somebody's making margarine with virgin olive oil -- a whole 12% of the product is olive oil -- guess what the other 88% is? 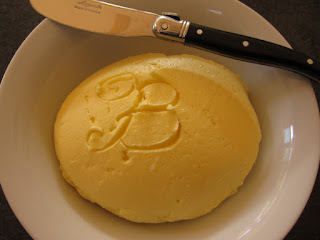 I wrote about making homemade butter a while back, and included my own recipe for plain butter and for cultured butter. However, I don't make my own butter any more because Lactantia brand unsalted cultured butter, made in Quebec, is now available locally, and in addition to being cheaper than homemade butter, there's the nostalgia factor. Quebec is my home, and Lactantia butter is the brand I was raised on. My own recipe included some yogurt culture, but this morning I got the monthly newsletter from New England Cheesemaking Company, where I get my yogurt culture and other cheesemaking ingredients, and it had a recipe for cultured butter made with buttermilk culture. Here is the link to the New England Cheesemaking Company recipe for cultured butter. What's nice about that recipe is that it is fully illustrated, and the method is exactly the one I used, so whether you use their recipe or mine, you now have a great set of instructions, and you just can't go wrong.